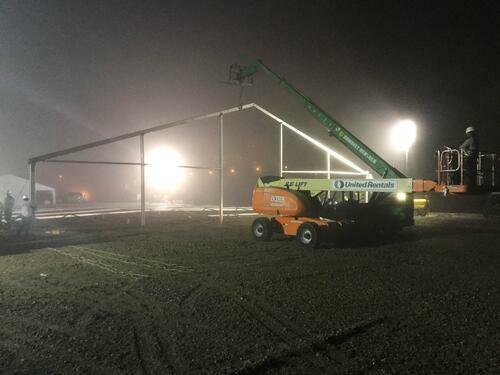 Mahaffey Fabric Structures was recently contacted by an energy company in Deweyville, Texas, in dire need of a temporary structure. Because of an impending flood, the company needed to move key equipment to higher ground as quickly as possible. Our client’s project initially required a completion deadline within 48 hours. They contacted Mahaffey on a Thursday evening and needed a finalized product by Sunday morning. However, flood waters began to rise at an unpredictable rate, causing the timeline for completion to be moved up even further. Mahaffey crews worked through the night to accommodate these needs, using minimal lighting to complete the installation. The Texas-based company contacted Camille Curry, project manager at Mahaffey’s Texas office, inquiring about our ability to work within such strict time constraints for this emergency. The lease agreement was signed within two hours of the initial inquiry. Crew members immediately began gathering inventory items to complete the project at Mahaffey’s headquarters in Memphis, Tennessee, and got them on their way to Texas. Because of the changing timeline, operational teams contacted nationwide installers who were available to help with the project. Crews from all over Texas and Louisiana were on hand, traveling up to 60 miles. The installation of the structures began within 24 hours of the initial contact. The installation was completed 12 hours later. This project required the use of 16 crew members (a project of this caliber would typically only require four crew members). Because of Mahaffey’s rapid response, our client was able to successfully protect its equipment from the rapidly rising flood waters. The project was complete within 36 hours, giving the plant plenty of time to get equipment out, while also saving significant company funds by keeping operations moving. Mahaffey’s expert crews continue to go above and beyond, putting customers first. They installed two structures within 12 hours – something that typically requires a four-day installation. Our customer was extremely pleased by the professional, quick response to their needs. 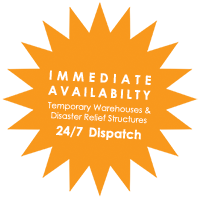 Interested in learning more about temporary warehouses and business continuity shelters, or want more information about the services we offer?